Bow 1983 by David Bratby. Keim Concreton & Decor Farb. Once a Fair, now a blank. 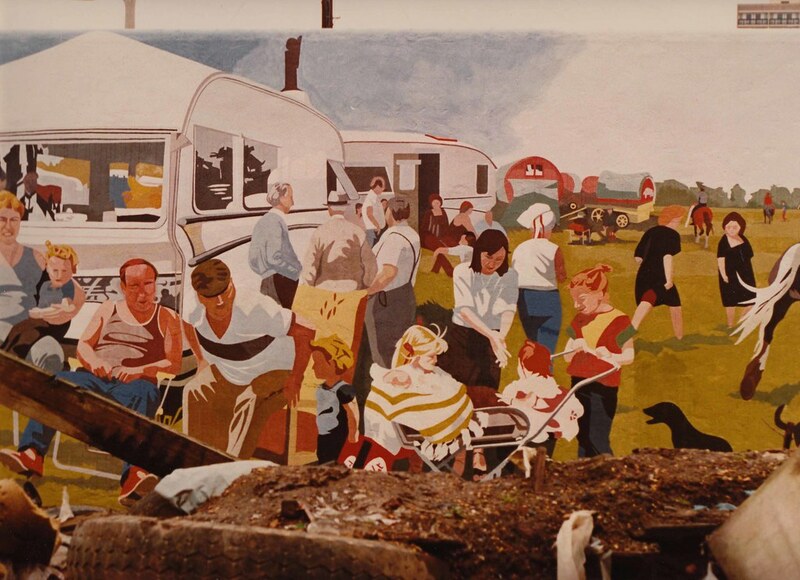 Back in 1983, Tower Hamlets council funded a mural to be painted on Eleanor Street, Bow, next door to the council travellers' site. Artist David Bratby designed this piece inspired by the annual Gypsy gathering at Paddock Wood in Kent. It took four months for the artist and local people from the site to paint the piece which included portraits of some of the travellers. The mural cost £3,000 and was painted with Keim paint to make sure it would last a long time - much effort had been made to create a mural which reflected positive images of gypsies and an art work that wouldn't fall apart too quickly. However, many people never got to see the mural as it was hidden behind a corrugated fence - the only way to see it was from the train or by clambering along a muddy path. David hoped the land in front could be used as a kids playground however it was already being transferred to British rail. In 2010, we went to look for the mural - it's gone though the wall is still there and any peeling paint reveals the colours underneath. It's a really nice piece of art - shame only a few people saw it.